Imagine you are sitting or lying by a gently flowing river on a fresh spring day in North Carolina. Birds are singing exuberantly and new vegetation is exploding fresh green colors into the world. Not many sounds in the whole world are as delightful as the sparkling sounds of that river and those birds. Not many except…. the sparkling sounds of a five-string banjo! After all, Stone River is in North Carolina, and North Carolina is where the five-string banjo really evolved into the instrument we know today. So as I sat on the banks of Stone River this last three springs, I thought to accompany the river’s song with a few banjo tunes of my own. Not to instigate some kind of dueling banjo contest or win fame and fortune, mind you, but rather to try to create a harmony duet with that river. Of all the instruments, it seems to me that the five-string has its’ own special magic, brilliance, and joyfulness. And I think it worked: The sparkling solo banjo blended well with the sounds of the river. Together, they make a joyful noise indeed. So I hope you enjoy these happy sounds and that they might help transport you to the verdant banks of Stone River or to one of your own favorite magical places. One bluegrass truism is: “If you want to play bluegrass, you gotta have a banjo in the band.” No argument about that! The drive, the punch, the “snap-crackle-pop” of the five-string helps define the bluegrass sound. And yes, on straight-ahead bluegrass songs, the five-string can be a pile-driver, a machine gun of staccato notes that nearly peel the paint off the walls. But as a solo instrument, the banjo can express so much more! In quiet, reflective moments, it can be as gentle, expressive, and even as tender as you want it to be. Just think of all the “back-porch,” “front-porch,” “living-room,” and “creek-side” pickers who worked out their own unique banjo styles long before and long after Bill Monroe, Earl Scruggs, Lester Flatt, and Chubby Wise invented the “modern bluegrass sound” in 1946 that so many try to replicate today. 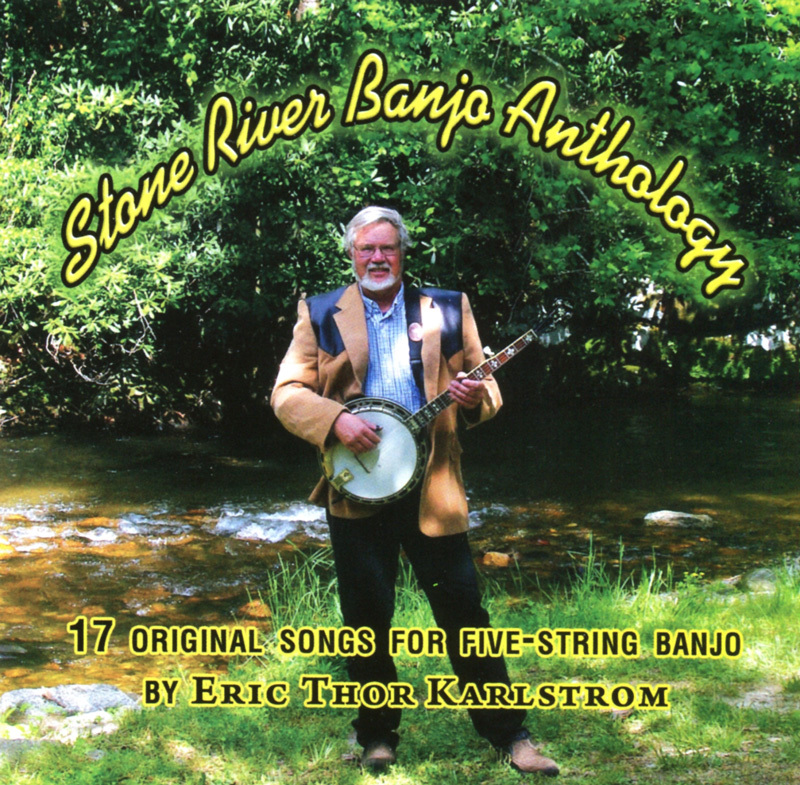 Now I definitely love bluegrass and have recorded a number of bluegrass-oriented CDs (www.erickarlstrom.com). In fact, several of the songs herein are bluegrass-type songs that would work well in a bluegrass band. But most of these songs come from that long tradition of “front-porch” and “creek-side pickers” who “whiled away” many a pleasant evening or afternoon finding fine, fun sounds with their fingers on the fretboard of a five-string. All songs are written and performed by Eric Thor Karlstrom at Don Richmond’s Howlin’ Dog Recording Studio in Alamosa, Colorado in March, 2015. Don Richmond plays rhythm guitar on track 17. My banjo is a “vintage” (i.e., pre-World War II) Gibson. Many thanks to all the banjo players, teachers, and makers(!) who came before and helped to invent and define this magical instrument. Special thanks to Jens Kruger of Wilkes County, North Carolina, whose virtuosity and originality as banjo player and teacher has inspired me to develop my own style on the five-string banjo.